In this edition of my Reader Question Series: What are the best options for lake house window treatments? A couple of weeks ago, I opened up the Satori Facebook page for another round of reader questions. I’m always curious to see what decorating dilemmas are on your mind. As usual, I won’t be able to answer all of the questions today, but I will try my best to address the issues you brought up in upcoming blog posts. 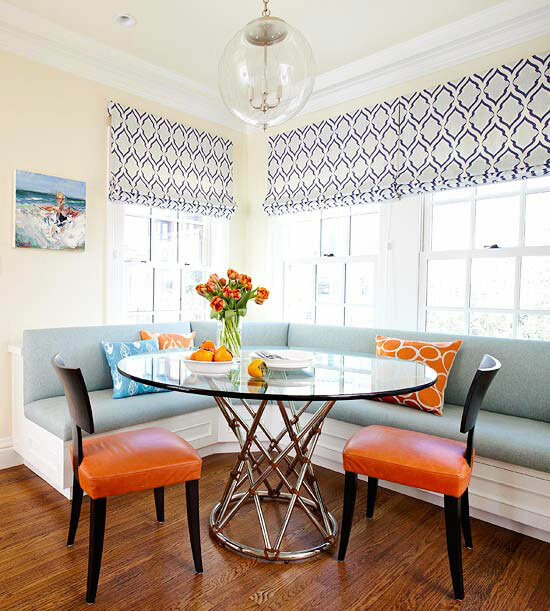 Today, I’m focusing on lake house window treatments (a problem most of us wish we had!). Blinds, Shades or Drapery as Lake House Window Treatments? “Hi Shauna, I enjoy getting your newsletter update. Can I ask a quick question? We are moving ahead with our lake house and I’m thinking about window coverings. I’m wondering if there are any basic rules to consider when approaching this. I have a lot of windows that face the lake and would like to leave open with no covering, yet worry about the sun and UV as these windows face south-west. My bedroom windows need coverings, but I’m struggling with color as they need to block light. As far as window treatments go, it’s difficult to select something specific without seeing the rooms, windows and view. In general, I like to keep coverings simple when there’s a beautiful view, such as a lake and its surroundings. Currently, I’m doing Hunter Douglas roller shades in a country home that has a mountain view. The benefit is you can roll them right up out of the way, but they provide light filtering or blackout (depending on the fabric opacity or lining) when needed during the heat of the day or night time. I like that you can still see through some of the sheer options when they’re down, but they protect your furniture from UV rays that tend to fade furniture, area rugs and other room elements. Roller shades have come a long way from the original vinyl types. In the country home, we selected an off-white linen look fabric for the common areas that need some light control, and we’re doing a natural sea grass woven material in the bedrooms that require darkening. Keeping the finishes natural and light are key to making the view the prominent feature. Another option to add a bit more character to your lake house is roman shades. These can be mounted above the window casing to keep the view as open as possible. For a lake house, I like colors that remind me of the water, such as blue, green, grey, sand and white. I usually choose a fabric that has the same background color as the window casing/trim to keep it looking fresh, like these blue and white roman blinds spotted on Better Homes & Gardens. 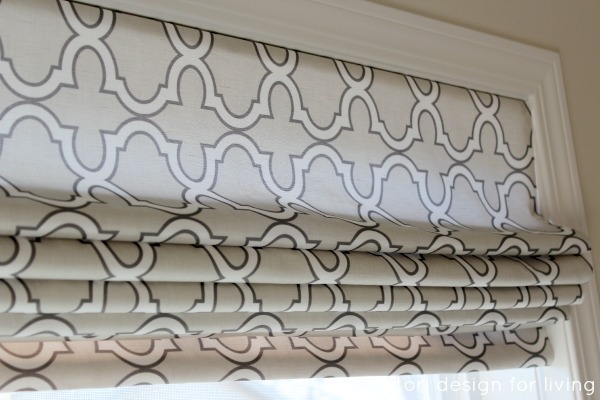 If you want to sew your own, check out my roman shade tutorial. Thanks for writing in, Holly. Be sure to keep us updated on your lake house progress! So, that’s all for now. If you have a decor, design or organizing question you could really use help with, follow the Satori Facebook Page to find out when the next open call for questions is. Go here to see the full line up of Reader Questions. We have a cottage and installed the light filtering roller shades you recommend. They’re great! I love all of your ideas Shauna! I agree, roller shades have come a long way and the new ones now look so sleek and chic! The ones you described made of white linen material will be gorgeous! Roman shades are always gorgeous too! You have me thinking now about our sliding door and what options we could go with. I like the sheer option and never would have thought of that. Just going to wait until the landscaping is done to see if the privacy issues are taken care of. Great question, and great advice! I like roller shades as well – My Dad has a nice view and he chose a sheer option – I was amazed at the filtering yet see-through quality of them. Definitely a far-cry from the nasty vinyl ones with tacky trim! I love that you are answering reader questions Shauna and this is a great one. You gave some perfect suggestions and examples. I also really like full length drapes on rods and rings with a wide stack back … This allows the drapes to be pushed right back out of the way while still framing up the views. Great advice and love your inspiration!! I added roller shades to my home last fall and really like the results so far! Linen in my bedroom and bamboo in my boys rooms! I’ve been resistant to mounting roman shades above the molding on my windows so far….I paid extra to have the nice molding on top, but the last image you shared in this post has me second guessing that decision…… I was going to order the fabric today so I must decide!!!! Love the roman shades you showed here – they really add so much to the room!